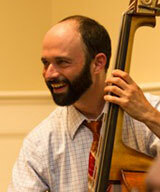 Bassist Matt Weiner is equally at home playing jazz, swing, old time, tango, Brazilian music, and almost anything else. He can be spotted around Seattle and elsewhere plucking, slapping, and bowing the bass in the Casey MacGill Trio, as well as with Del Rey, Barton Carroll, Marco de Carvalho, Eli Rosenblatt, Miles & Karina, Bric-a-Brac Trio, Wayne Horvitz, the Tall Boys, Chicharra Tango, and many others. He has performed and recorded with other talented folks including the Todalo Shakers, Hannalee, the Hot Club of Cowtown, the Asylum Street Spankers, The Flying Neutrinos, Butch Thompson, Lyle Ritz, Becky Kilgore, Danny Barnes, Matt Munisteri, Meredith Axelrod, James Hill, and Rani Arbo. Matt played the role of bass player Joe B. Mauldin in the 5th Avenue Theatre production of Buddy: The Buddy Holly Story. At the Ukeshack #1, an album of bass and ukulele duets he recorded with Del Rey, was released in 2007. He has taught at the Portland Ukulele Festival, Menucha Ukulele band Camp, the Port Townsend Acoustic Blues Workshop, and the Port Townsend Ukuele Festival.